TortoiseSVN is an easy-to-use SCM/source control software for Windows and possibly the best standalone Apache™ Subversion® client there is. One of the great features of TortoiseSVN is that it remembers every change made to its files and directories. Meanwhile, tagging can make this process much easier by giving you the specific revision. Here is the instruction to tell you how to create a Tag and perform a revert in TortoiseSVN. 1. Select your working copy, right click on it to open TortoiseSVN’ menu. 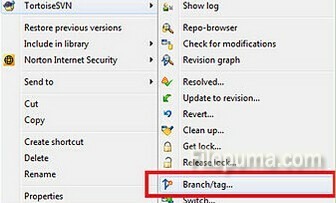 Select the ‘Branch/Tag option. 2. Select the tags path and add the tag you want. Add an appropriate log message. 6. Confirm you wish to revert. 7. TortoiseSVN will now revert to this earlier revision.